Could sheriff’s deputies have prevented Isla Vista killings? 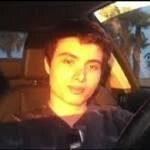 The parents of three murdered college students are suing Santa Barbara County and it sheriff’s office, as well as an Isla Vista apartment complex and its parent company, alleging that they hold partial responsibility for the killing spree carried out last year by Elliot Rodger. Los Angeles law firms Becker Law Group and McNicholas & McNicholas filed the lawsuit in federal court. The suit faults sheriff’s deputies for failing to perform a gun background check while examining Rodger’s welfare less than a month before the killing spree. “At that time, Mr. Rodger had a cache of weapons and ammunition in his room and commented in his diary that he was relieved the deputies didn’t check his room because his plan would have been ruined,” a press release about the lawsuit states. The three victims, whose deaths are the subject of the lawsuit, died due to stab wounds, according to the sheriff’s report on Rodger’s crime spree. Weihang Wang, Chen Hong and George Chen suffered 15, 25 and 94 stab wounds respectively, the sheriff’s report states. Both Wong and Hong were Rodger’s roommates. Chen was at Rodger’s apartment when the killing spree began. The suit also faults sheriff’s deputies for failing to watch videos that Rodger had posted on YouTube. A mental health worker tipping the sheriff’s office about the videos prompted the welfare check, the suit alleges. Isla Vista complex Capri Apartments also failed to perform a proper background check, according to the suit. The plaintiffs also accuse the complex of not conducting a reasonable investigation of Rodger and of failing to warn Rodger’s roommates of his unstable and violent tendencies. Rodger shot three students to death after stabbing the men in his apartment. He then killed himself during a gun battle with deputies. My guess is the County will ask for a Motion for Summary Judgement on the grounds that police have no affirmative duty to protect, as stated in California Govt Code 845 and upheld in DeShaney vs. Winnebago County and Castle Rock vs. Gonzales, both U.S. Supreme Court cases that require that a “special relationship” exist and that the government had the authority to act. In this case even if they had run a check and found weapons registered to him, the police had no authority to enter his room to search, absent his consent and no legal mechanism existed to get a search warrant from the court. This last area has since been changed, but cannot be applied retroactively. The only way this case will procede is if a judge finds a “special relationship” exists. It should be interesting to see how a judge rules, if the county doesn’t make a business decision that paying “go away” money is cheaper than paying their lawyers to defend them. My thoughts exactly, Gordo. Monday morning quarter backs would have the officers to enter his residence against his will and seize weapons without legal authority. I am glad our govt does not yet have that authority and pray it never will. I recently watched a movie where the government were the only ones with firearms. I highly recommend every see it. It called Schindlers List. Why hasn’t some ambulance chasing lawyer further taken advantage of one of the grieving families by suggesting they file suit against all the local sorority houses for discriminating against Elliott Rodgers when he was alive? After all this little freak went on a killing spree mainly because he couldn’t get laid. He must have had serious issues not to get any action living near UCSB / SB City. Of all the comments posted here, no one mentions that the people who filed the lawsuit were NOT expecting law enforcement to be mind readers. The perp POSTED VIDEOS ON YOUTUBE which outlined exactly what he was planning to do, etc. and law enforcement, after being allerted, chose to ignore this opportunity to get a clue. Litterally. Seriously, just how far does someone have to go to warn us that they are about to go postal before action to prevent is taken????? I have to side with those who have filed suit, because if there is no oversite of such a gross lack of responsibility and I have to include incompetence, then why have a police department in the first place? Maybe this is a training issue. If so, then all the more reason to make some changes. If we are not going to address mental illness before it gets to this point, then we need to get a lot better at recognizing it when it does. There’s this little thing call the US Constitution my friend Francesca. We don’t take people’s rights away without due process. If you want to change that…then you will live even more than you do today in a police state.